Explanation: Sometimes the sky lights up unexpectedly. A trip to northern Norway to photograph aurorae was not going as well as hoped. 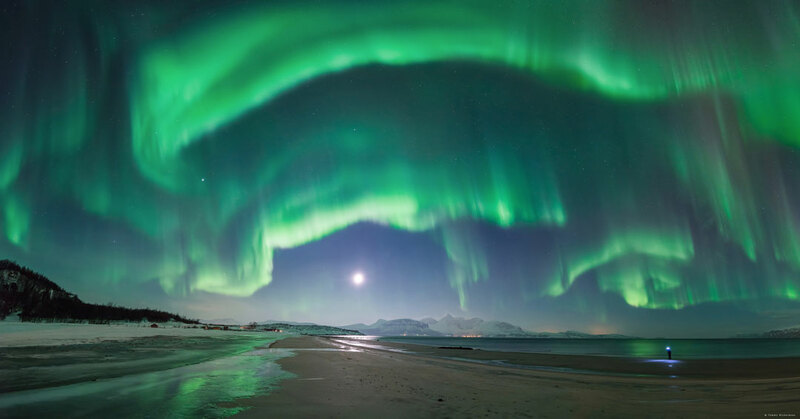 It was now past midnight in Steinsvik, Troms, in northern Norway, and the date was 2014 February 8. Despite recent activity on the Sun, the skies were disappointing. Therefore, the astrophotographer began packing up to go. His brother began searching for a missing lens cap. When the sky suddenly exploded with spectacular aurora. Reacting quickly, a sequence detailing dramatic green curtains was captured, with the bright Moon near the image centre, and the lens-cap seeking brother on the far right. The auroral flare lasted only a few minutes, but the memory of this event, the photographer speculates, will last much longer.